It seems that in recent years, nearly every week has brought a new proposal for development in Toronto as the city’s booming real estate market shows no signs of slowing down. These proposals have gradually increased in scale: the towers are growing taller, the density is climbing higher, and the number of towers in each development is ticking upwards. As the city grows up, one can’t help but wonder, what will our skyline look like once all these projects are built out? That is exactly what Scott Dickson—known as 3Dementia on the UrbanToronto Forum—set out to visualize when he was commissioned by Toronto Life to put together an image of the city’s projected downtown skyline in 2020 in celebration of the magazine’s 50th anniversary. Enlisting the help of fellow illustrator Robert Koopmans, the two have produced a rendering depicting the Toronto of the future, and the result is as exhilarating, terrifying, and captivating as one might expect. 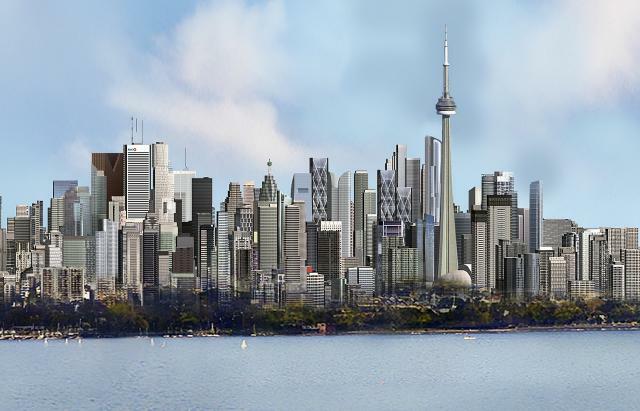 Image of Toronto in 2020 from Yorkville to the waterfront, image courtesy of Toronto Life. 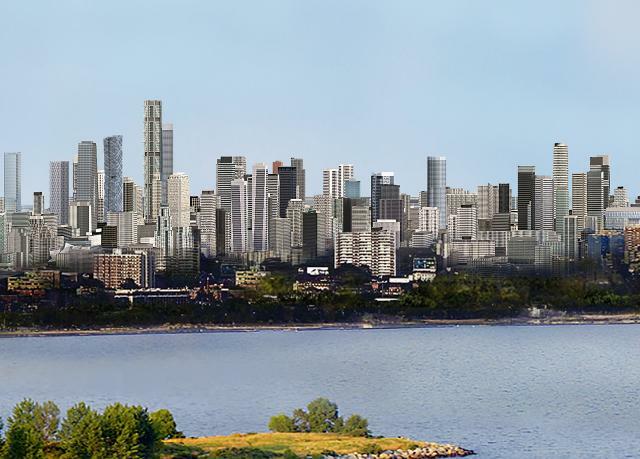 The rendering is a shot looking eastward from Humber Bay Park: a full-size version can be found here. Depicted in the image is every building currently under construction, approved, or recently proposed, carefully placed amongst Toronto’s existing forest of skyscrapers. The only projects excluded from the image are what Dickson called “stale proposals”, developments that have seen little to no progress over the past couple years. The process of producing the image is a painstakingly meticulous one, but one that Dickson and Koopmans have been doing for years as a favourite pastime. Dickson has become well known for his depictions of the Toronto skyline over the past two decades, managing to turn his hobby into a source of income, and Koopmans has spent countless hours crafting diagrams of future skyscrapers that he has contributed to the website, skyscraperpage.com. But for Dickson, this commission proved challenging given its tight deadline and scope of work involved. A close-up view of the Yorkville area, image courtesy of Toronto Life. The process began with Koopmans producing a base image of the desired view that Dickson then used to refine into a photorealistic rendering. 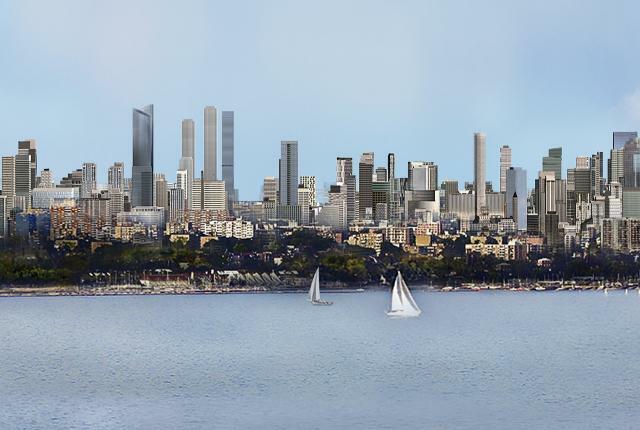 The view of the existing skyline from Humber Bay Park was chosen at the start as a preferable shot to work with, given its panoramic range stretching from Yorkville to the waterfront. Referencing this chosen view as a guide, Koopmans then used Second Life, an online 3D modelling software and social platform, to accurately grab the correct angle of the view so as to seamlessly merge a snapshot of the digital model with the existing photograph. Koopmans’ Second Life model has been a work in progress over the past year or so, where he has been slowly piecing together the downtown Toronto skyline building by building – nearly 1200 structures in total. Compiling information from a variety of sources, Koopmans carefully models each building to its proper height and form, usually referencing whatever data he can find from Google Earth, photographs, renderings, and websites. Using a base map, often from Google Earth, and geographical coordinates, he properly sites each building in Second Life to fit within Toronto’s urban grid. Once the massing is established, Koopmans then uses his own diagrams from skyscraperpage.com or available renderings to map a texture onto the forms, bringing the building to life with its appropriate skin. Some artistic license is taken throughout this whole process, as there is often limited data to work with, especially with new proposals, some of which only provide a single rendering that may not even show the entire building. A close-up view of central downtown, from roughly College to Queen Streets, image courtesy of Toronto Life. Once the snapshot of the 3D model was merged with the photo, Dickson then had a base to work with, albeit one that was rough around the edges, so to speak. The buildings rendered in the 3D program looked more like conceptual massing models, rather than accurate depictions of what they will eventually look like, so Dickson set about cleaning up the image to create a more photorealistic representation. Using Photoshop, Dickson sampled renderings of each proposal – often using Koopmans’ remarkably detailed illustrations from skyscraperpage.com – and meticulously applied the skin on each building, taking care to get the angles and proportions correct on each structure. Logging over 100 hours on the single image, nearly every new building in the rendering received a carefully applied envelope that solidified its place in Toronto’s downtown vista. A close-up view of the Financial District, South Core, and the waterfront, image courtesy of Toronto Life. The result is a fascinating depiction of Toronto’s future, a dense agglomeration of towers framed by leafy shoreline vegetation and green neighbourhoods. Our city is growing up, poised to become a global city of skyscrapers, and the commission by Toronto Life provides a glimpse of what may come to be. Through a team effort of 3D-modelling, rendering, and photo-editing, and a good deal of dedicated time and hard work, the talented duo of Dickson and Koopmans have given us something we can all get excited about.